Over? Did you say over? As I write this post, there are 11 trucks on the field at Fenway Park preparing to lay down turf over the infield for Wednesday’s soccer game. From the moment the players left the field today, a crew started taking apart the mound. Based on the pick-axes they are using, apparently that dirt and clay was packed in there pretty tight. It looks like a scene from the end of the season. With the Sox having lost of eight of their last 11 games, I’m sure a lot of people feel that way, too. No town embraces doom and gloom better than Boston. Everybody wants to be first with the bad news for some reason. That there is a 10-game West Coast road trip starting tomorrow in Oakland will only add to the panic. The reality is the Red Sox are 3.5 games out of a playoff spot with 70 left to play. No offense to those who will, but declaring the season over makes little sense. Sure, the Sox are in trouble and need to get their act together. But Oakland and Seattle are lousy teams. Meanwhile, Andy Pettitte is out 4-6 weeks with a groin tear and A.J. Burnett’s 4.99 ERA has him punching walls. Derek Jeter’s OPS is a few points better than Marco Scutaro’s. The Yankees are a good team, but they’re not as good as they were last year, so do not discount the division. Jeremy Hermida will be back Thursday. Josh Beckett returns on Friday. Victor Martinez played catch today and figures to get a little better every day. The spring-training lineups will start to disappear soon enough. 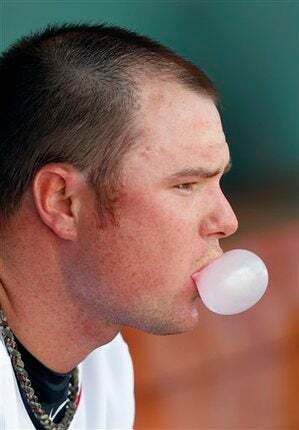 You also have to be encouraged by a bullpen that now includes Jonathan Papelbon, Daniel Bard, Manny Delcarmen and Michael Bowden in key roles instead of Hideki Okajima, Ramon Ramirez and that combustible crew. The team losing games now is not the team that will be on the field next week. And that team will get better the week after that. Terry Francona was asked a softball question about the road trip. The stock answer would be to say the games were critical and offer some pablum to the panicked. To his credit, he didn’t do that. Thanks to everybody for reading the blog this weekend. I will not pick up the road trip until Thursday in Seattle, but Amalie and Nick will be in Oakland and Extra Bases will roll on deep into the night.